Check out a pirate themed party in these free printable party supplies. Save valuable time and cost by seeking affordable party supplies and party kits you can print for free. 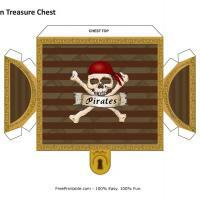 A real hidden gem is the printable party supplies pirate treasure chest. It is perfect to fill with goodies and trinkets for party favors. Complete the pirate theme with these free printable party supplies from the pirate party kit including the invitation, the eye patch, and the pirate hat. Kids want a pirate themed birthday party and parties are expensive. We have a solution with free printable party supplies pirate treasure chest. Next, move on to the invitations in the large printable party supplies section. The free printable pirate treasure chest serves as a party favor when filled to the brim with candy. Print several for free. Fill them with small prizes and use them in a scavenger hunt. No pirate would be caught not wearing an eye patch. Good thing this free printable party kit includes a sheet of eye patches all free and enough for all guests. Are you looking for free printable party supplies? Do you need a complete party package of pirate party decorations? 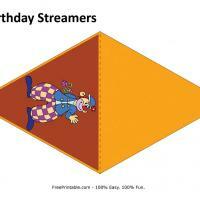 Free party supplies printable at home saves your valuable time and hard earned money. Survey our printable pirate party supplies and you will find printable pirate hats, free printable eye patches and a pirate treasure chest. Print it for free and all you have to do is fill it with candy and other goodies as a fun party favor. 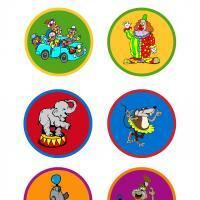 More printable party supplies include pirate party invitations and party games. All free printables are easy to download and print. Be sure and use our customization features and include the guest's name on each printable pirate treasure chest for that personal touch. Free printable party supplies for pirates are the hidden gem you have been seeking.